I find, a bit to my surprise, that I am in a rather chatty, light-hearted mood today, making this the perfect time to finally tackle all of the Katie Fforde novels I have been meaning to talk about for months. I love Fforde’s books and count her as one of my go-to comfort read authors. Her books are fun and frivolous, just the right thing for a lazy summer day at the beach, a sick day at home under the comforter, or just any time you feel the need for a bit of highly improbably but deeply satisfying romantic escapism. Yes, her male characters are consistently flat, her romantic pairings are varying degrees of improbable, and the overall results vary widely in quality but when she is good, she is very, very good and when she is not, she is still far better than most. I tend to read Fforde’s books in great, dizzying gulps, picking up handfuls at a time and reading them one after another. I am not a reader who believes in moderation, particularly when it comes to light books like these. Where is the fun in reading just one? I love reading half a dozen over the course of a week or two, until my appetite for Fforde’s writing is more than sated, at which point I abandon her for a few months or a year, however long it takes until I feel the need to do it all over again. Clearly, this is not an approach that works for everyone but I find it delightful. This year, I started my reading off with Wild Designs (1996), which I always enjoy rereading. 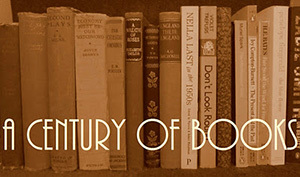 Part of what I love about it is its “older” (at least older for these sorts of novels) heroine. Althea, a divorced mother of three, is in her late thirties as the novel begins and, as in any Fforde novel, the focus is not just on getting her a man but on getting her life sorted out as an individual. Gardening is Althea’s passion and the story, including her romance with handsome architect Patrick, revolves around her efforts to establish herself as a garden designer. As a budding gardener myself, I was able to sympathize more with Althea now that I share her interests than I ever had on previous readings. The descriptions of her garden designs make them sound atrocious but I was willing to just suspend my disbelief and have fun with the story, which I of course did. As always with Fforde, the book is jammed with characters and full of events. Althea goes to France, entertains her ex-husband, loses her job, wins the chance to show a garden plot at the Chelsea Flower show, helps her controlling younger sister through her first pregnancy, takes care of her three teenagers, watches her ex-husband take off with the girlfriend of the gorgeous Patrick, sells and moves house, and, of course, blunders through a romance with Patrick. How does she find the energy to do it? Some of the details felt strangely distant, moments where I thought “hey, I’d forgotten all about that”, but served as fun reminders of the not-so-distant past. The book came out in 1996 and Althea’s ex-husband, having spent years in Hong Kong, comes home so as to be gone before the 1997 transfer of sovereignty. When checking into a hotel with a man, Althea is conscious and vaguely embarrassed that the desk clerk knows they are not married. How the world has changed. 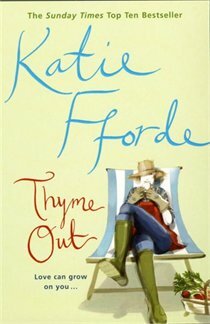 Thyme Out (2000), which I moved on to next, might have replaced Flora’s Lot as my favourite of Fforde’s books. It is the story of Perdita, who runs a market gardening supplying local chefs with fresh produce. In her late twenties, Perdita has a successful if not particularly profitable business and friendly relations with her customers. She is best friends with the 87-year old Kitty, Perdita’s mother’s godmother (what an illegible description) who always took young Perdita in on school holidays, while her diplomatic parents were abroad. She also took Perdita in after a hasty, disastrous marriage and divorce in her late teens and helped the younger woman build up her confidence and get back on her feet. There has been no man in the picture since Perdita’s divorce but she promises she’ll get on to that. Eventually. But then Lucas, her ex-husband, appears, no longer the stressed City boy she was married to but a rising young chef at the local high-end hotel. Slowly, the two get to know one another again, clashing all the way, and Perdita, who has spent the last decade blaming Lucas entirely for the divorce, is finally able to see the role she played in their marital woes. Even more than Lucas, this book is about Perdita’s relationship with Kitty, the one person who has always been there for her. She cannot come to terms with the prospect of the elderly and ailing Kitty’s death and Perdita pushes herself to the breaking point while caring for Kitty after she suffers a series of strokes. When the inevitable happens, Perdita goes to pieces. As usual, there are suitably random moments that seem to exist entirely to bulk up the novel (Perdita’s Christmas spent with an old school friend’s young family is particularly unrelated to the main plot) but part of what I love about Fforde’s novels is how busy her character’s lives are. These people all have things to do aside from having complicated emotional entanglements; they spend just as much time focusing on friends, family, and especially work as they do love interests. Restoring Grace (2004) and Summer of Love (2011) both deal with multiple protagonists (though the division of attention is far from equal in Summer of Love) and I never find this setup particularly satisfying. All of the characters suffer, coming across as slight and unbelievable, making it difficult for me to sympathize with any of them. Restoring Grace has fun details about art restoration but that’s really the only thing that stands out in my mind about it. 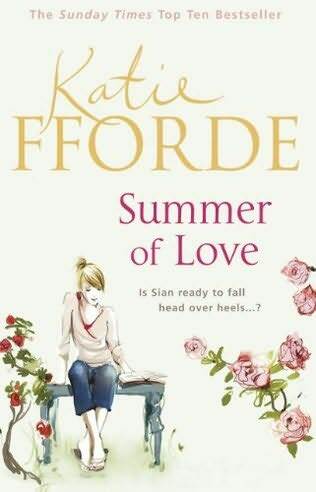 Summer of Love, which was my least favourite of the six of Fforde’s books that I read this spring, did do one thing very well: it had a believable child character. Rory, the protagonist Sian’s four-year-old son, is thankfully unprecocious and behaves in a completely normal, unexceptional way. It is amazing how rarely that happens. 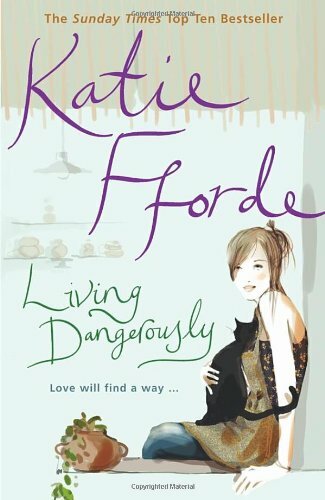 Reading Living Dangerous (1995) after having read so much of Fforde’s later work, it is easy to spot that this was her first novel. Polly, the thirty-five year old, aspiring potter protagonist, is the recognizable prototype for future Fforde heroines. The romance, however, is a bit of a mess. David is a distant hero, whose character seems to shift from chapter to chapter. He is blandly inoffensive and though Fforde’s male characters have never really evolved into rounded, compelling individuals, he is definitely the flattest of the bunch. The supporting cast is excellent though, from the uppity Melissa, at whose dinner party Polly and David meet, to Patrick, David’s teenage son, to Tristan, the bad boy radio journalist (an amusing contrast), who provides an unthreatening touch of excitement. It was also interesting to see Fforde play with ideas and settings she returned to in later books (all generally to be used to better affect than they were here). 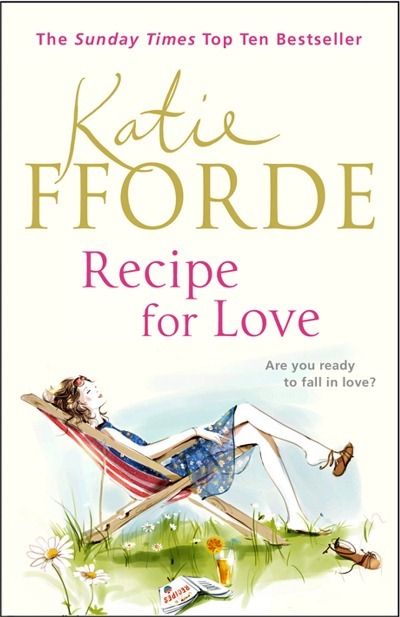 Finally, after a bit of a break since I was at the mercy of the library, I read Fforde’s most recent book: Recipe for Love (2012). I adored it. I giggled and laughed my way through it in one evening, thrilled that after string of disappointing recent efforts Fforde was back on form. I also honestly liked the main characters, which, as much as I enjoyed reading the other books, has not always been the case (the obvious exceptions being my two favourites: Flora’s Lot and Thyme Out). The premise is fantastic: Zoe is a contestant on a television cookery show and falls for Gideon, one of the judges. I loved reading about the cooking challenges and was thoroughly entertained by all of the other contestants, from the very nice to the very nasty. Most of all, I loved reading about Zoe’s growing friendship with Fen and Rupert, supporting characters from Fforde’s earlier novels, who are hosting the cast and crew on their struggling estate. The friendly Zoe is always popping in and out of the big house, helping out the pregnant Fen when Rupert is away or busy, and when Gideon comes to stay in the house the progression of their relationship makes sense (not always a given in Fforde’s books). Zoe’s helpfulness, always pitching in to avert crises even when it means she might do poorly in the competition, only made her more delightful. I do like nice characters, especially ones like Zoe who prove you can be nice without being a pushover. After all of those, unsurprisingly, my need for Fforde’s fiction was met. Looking back on my reading notes from February and March, which is when I was working my way through these books, the most common word I used in my write ups was fun. And that they absolutely are. What a lovely post on Katie, who is as lovely in reality as the stories she writes. 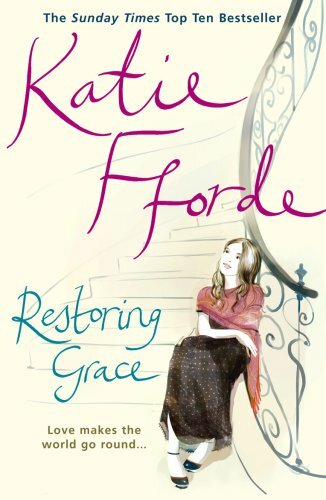 I’ve never heard of Katie Fjord until I started reading your posts. I do love gardening and also have interest in the other pursuits her heriones seem to pursue- art, cooking, etc.- so these look like fun escapist reads. I just might give her a try someday. It’s not usual that the characters in books I read share my hobbies! 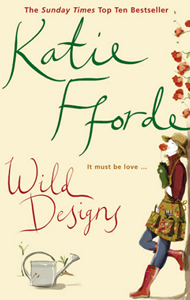 I’ve read all of Katie Fforde’s novels too, except for the very last one, which I don’t think is out in France yet. My favourite is probably The Rose Revived, but I have fond memories of Thyme Out as well. As you say, definitely light reading, and definitely not flawless, but fun nonetheless. Thank you for a great post on this author. I have not heard of her and am now inspired to read one of her books. I love learning about your favorite writers. Have a great weekend. I have only picked up Katie’s books this year, and bought up a few and now enjoying them immensely. I have to stop myself from just reading on after the other for fear of them running out. I’m so glad to hear she’s back on form… I loved her earlier books but was a little disappointed in some of her later ones. Now I have Recipe for Love to look forward to! I have not seen these around much, but they are beautiful books and I like the sound of the story line. I will have to give one a try.